One of the keys to stunning landscape photographs is so obvious that it is often overlooked. If you find your landscapes lacking in awe, try adding these three elements: a foreground, middle, and background. As simple as it seems, a lot of photographers often place too much focus on just one of the elements and forget about the other two sections when composing their landscapes. By adding these three compositional ingredients and paying them all equal amounts of attention, you can take your landscapes from flat and dull to riveting images you will be proud to hang on your walls. Let's take a look at a few examples below to see why this is so important. 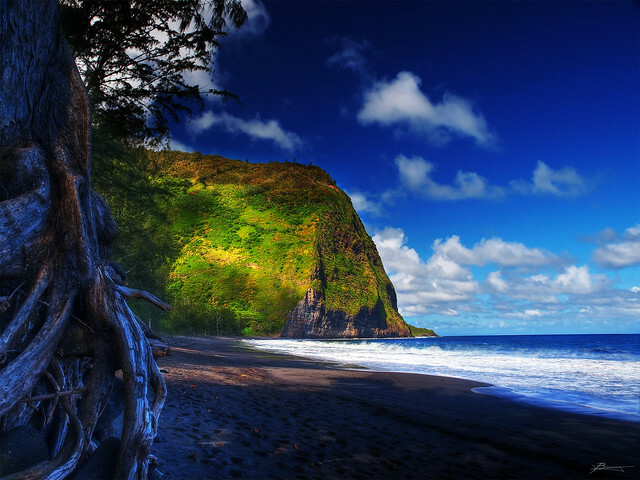 Check out this gorgeous photo of Waipio Valley in Hawaii shot by the ever-so-talented Paul Bica. The large cliff in the background is the center of attention in this photo, and is what the eye is drawn to almost immediately due, in part, by the gorgeous sunlight highlighting the ridge. But, since Paul has done such an exceptional job of composing this shot, the eye isn't fixated on just one section of the photo, the image itself invites the viewers eye to wander across it's plane. The tree in the foreground, the perfect blue sky, and the quiet beach setting in the middle of the photo all offer aesthetic support to the background without–and this is key–making the image look cluttered or too busy. The foreground is a major compositional element to landscape photography and also under utilized. In the example above, again by Paul Bica, the palms and greenery in the foreground add an interesting framing effect to the landscape which helps point the eye in the right direction without blocking the view of any of the other elements in the photograph. 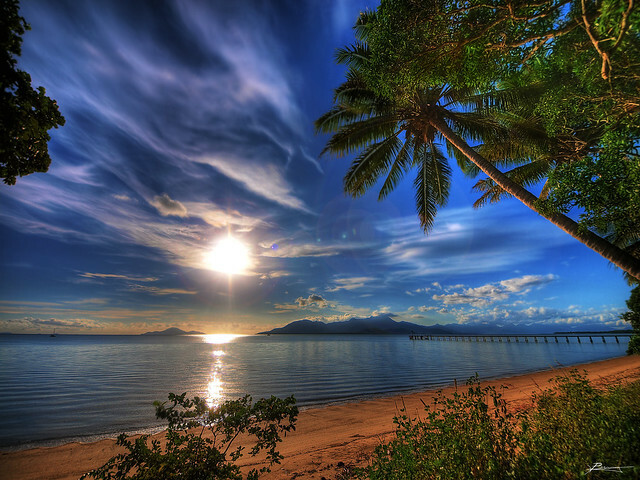 In combination with the middle ground–in this case, the pier–the eye is conveniently led to the shining sun and mountains in the background, but only after you have taken in the beauty of the trees and pier. Starting to see the trend? Again, all three of the elements–the foreground, middle, and background–are working together. Despite there being a clear subject, no single focal point is overwhelming the shot. Adding in a middle element can be a complicated thing if it's not intended to become the main subject of the photograph. Bica did a great job of doing so with the pier in the example image, Pacific Morning, that we used in the Foreground section of this article. With a little forethought, he was able to use the middle as a leading line to the background. Even when it is intended to be the main focal point of the landscape, the middle can still be tricky to get it to harmonize with the fore and backgrounds without taking complete charge of the shot. Zach Dischner was able to do so with his image, Lines In The Sand, that you see just above. 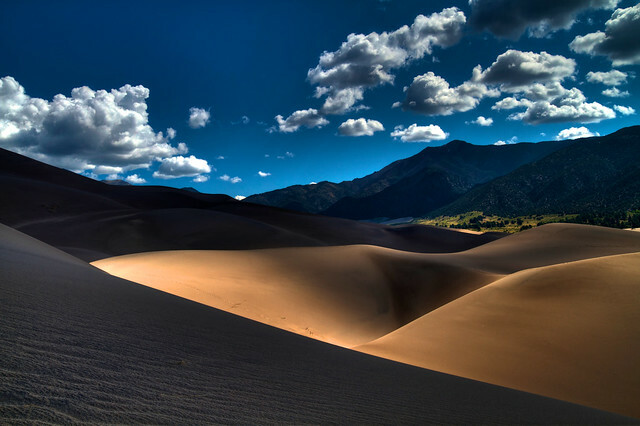 By utilizing the interesting light pattern that highlights the mid-section, he is able to make some of the sand dunes and green valley the subject of this image, while the contrast created between the darkened sand dunes in the foreground and mountains in the background against the blue sky, help balance the viewers eye and take in the entire image, not just the well-lit areas. Incorporating these elements, or at least a combination of them, will give your landscape images more depth which is almost like an instant dose of visual appeal. Remember, when you are composing your shots, make sure that one single section isn't doing all the work and making your landscape more of a portrait. Take the time to thoroughly look at the foreground, middle, and background to develop a frame that shows correlation, flow, and unity between all three. This will give your landscapes that well thought out appearance that separates a professional looking shot from a snapshot.